Genesis Series Saunas™ are the safe, effective and affordable way to relieve stress and improve health, right in the comfort of your own home! The Genesis 3 Person Corner Infrared Sauna is perfect for experiencing the relaxation of a spa without leaving your house. It fits conveniently into the corner of any room, instantly converting it into an oasis of rest and relaxation. The Genesis exclusive InfraWave FAR heat technology heaters emit ultra low levels of EMF, safe, efficient and beneficial to your health. Built in Value Added Upgrades - including towel hooks, magazine rack, CD player with mp3 plug-in, back rests, 7 color CHROMOTHERAPY light and an oxygen ionizer. Features 7 carbon heaters (1,740 WATTS) - Energy efficient - high quality heaters means your Genesis Infrared Sauna™ is more effective! Fabricated from premium grade solid Hemlock wood - tongue & groove joinery for superior edge to edge strength and durability. Equipped with "EZ - Touch" interior and exterior LED Control pads – fast easy temperature adjustment from inside or outside. The sauna comes standard with a pre - installed user friendly radio with CD player and AUX mp3 connection and built in speakers. The 3 person Genesis Sauna includes - 3 backrests, ergonomically designed to eliminate fatigue and discomfort and provide ultimate sauna relaxation and comfort. Comfortably seats 3 people on the extra deep benches that runs along the back walls of the sauna. 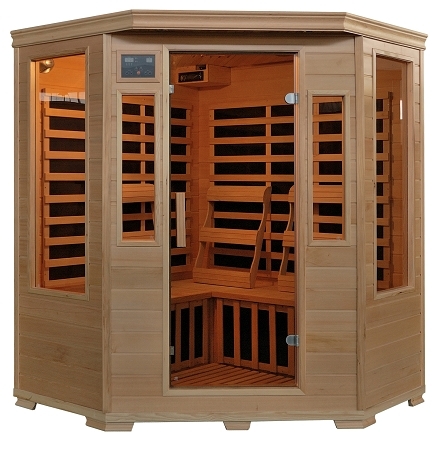 Once assembled the 3 person Genesis sauna measures approximately 55"x55"x75" and weighs 400 lbs.